Santa Teresa, NM – Officials from the Union Pacific Railroad and the State of New Mexico were on-hand recently to officially christen the rail carrier’s new $400 million, 300-acre rail facility in Santa Teresa. The facility sits on a 2,200 tract of land purchased by the UP and is located near the city’s three industrial parks and the Santa Teresa port of entry. The new terminal includes one of Union Pacific’s largest fueling facilities and the railroad’s largest intermodal freight terminal along the US-Mexico border. 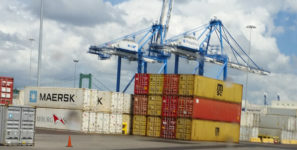 The high-tech intermodal terminal opened April 1 and is expected to process more than 170,000 freight containers this year. It is to be expanded in future years to eventually handle 700,000 containers a year. 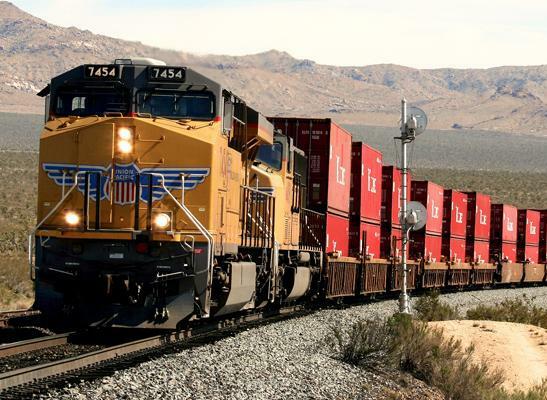 Union Pacific generated about $4 billion in intermodal business last year — 20 percent of its total freight sales of $20.7 billion. The state Legislature’s passage of a bill exempting Union Pacific from paying locomotive fuel tax was a key piece to get Union Pacific to build the facility, officials said. That bill was signed by New Mexico Gov. Susana Martinez in March 2011. Construction began in the summer of that year. A series of land swaps between the state, the federal government, and the Union Pacific allowed the railroad to acquire the 2,200 acres in Santa Teresa, most of it owned by the Bureau of Land Management, according to the New Mexico Public Regulation Commission.